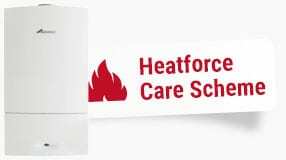 Heatforce is working in association with Vaillant boilers with backing from one of the BIG 6 energy companies to replace faulty & inefficient boilers with high efficiency “A rated” condensing boilers and combination boilers. To be eligible for the scheme you need to live in either a privately rented property or own your own home and be in receipt of certain qualifying benefits. Private landlords can also enquire as your tenants could be eligible. This could mean you get a heavily subsidised new boiler fitted at your properties. There is no limit to the number of properties you could have. To find out if you are eligible for a free or subsidised boiler, just fill out the form below and we will be in touch. Alternatively call us on 029 2076 3622 (please have the details of benefits and the existing boiler at time of call). Covering all call outs, labour and material costs from just £11.99 a month, including your annual gas service. You could be eligible for a heavily subsidised boiler for your home. Find out if you qualify.